Fiery pink pepper with ginger and patchouli from London via the Gulf of Guinea. The notes include pink pepper, tangerine, African ginger, cistus flower, oakmoss and patchouli. 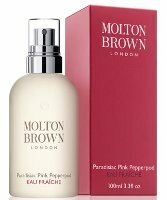 Molton Brown Paradisiac Pink Pepperpod is available now for pre-order at Neiman Marcus, in 100 ml Eau Fraiche for $45. Try saying that name five times fast! I suppose someone will find the alliteration cute? Okay, Joe, I’ll cop to it. I thought it was cute. I mean, prolly not gonna buy it, but I actually smiled. Waiter, there is too much pepper in my paprikash, but I would be pleased to partake of your pecan pie. Gary Oldman playing the inebriated actor in “Friends”, spitting all over Joey every time he said a word beginning with P – which was a lot. Aren’t “Eau Fraiche” more suited for the summer not autumn? This brand really only does light fragrances.